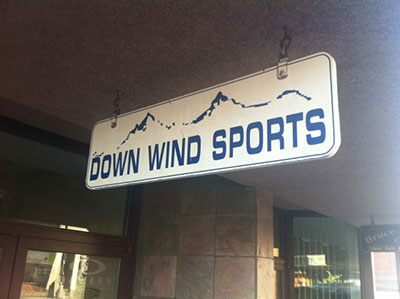 Down Wind Sports North was established in 1988 on Shelden Ave. in downtown Houghton by the owners and a former employee of the Down Winds Sports in Marquette. The Houghton store created its own image by adding some products unique to the area, while selling many of the same products sold in the Marquette store. Down Wind Sports North was established in 1988 on Shelden Ave. in downtown Houghton by the owners and a former employee of the Down Winds Sports in Marquette. The Houghton store created its own image by adding some products unique to the area, while selling many of the same products sold in the Marquette store. In October of 1995, as a result of a major fire that burned down the Library Bar and Restaurant, Down Wind Sports North moved to the Sharon Center and was located in the spaced currently housing the Ming Super Buffet. In May of 2000, the current owners of the Marquette store purchased Down Wind Sports North and moved the shop back downtown to its present location at 308 Shelden Ave.